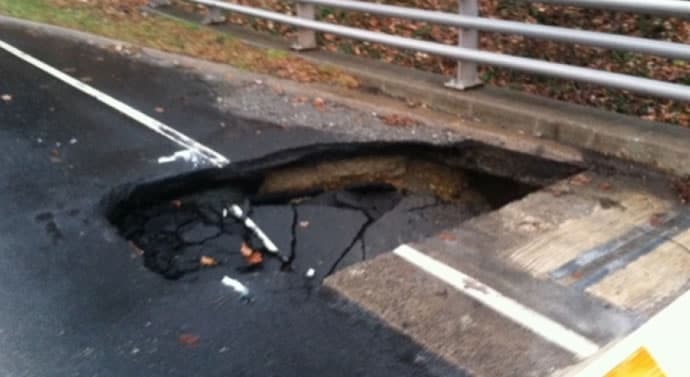 * Above photo shows the large sinkhole closed a section of southbound G. Washington Parkway starting Monday night. If you manage a town, homeowner’s association, factory, business or other organization, you naturally want to extend any investment you make in the area under your stewardship—right down to your asphalt pavement. Did you know that a well-constructed and well-maintained asphalt road or parking lot can last up to two decades? At the same time, forgoing regular maintenance and ignoring cracks can reduce pavement’s life all the way down to 5 years or less! Clearly, staying on top of those cracks in the road pays off! Here we discuss how to identify various types of cracks in the road and how they can be fixed. Whenever you find asphalt cracking, call Espina Paving at 703-491-9100 for repairs—we know how to repair asphalt cracks in the road to keep your vehicles and people safe while making your investment last even longer! If your asphalt company laid down asphalt mix that was too old or too dry, the surface layer of the asphalt may develop cracks that look like circles or squares. Block cracking generally shows up two or three years after the asphalt was first installed. Luckily, this type of cracking does not usually go into the foundation layers. We can generally repair these cracks with a thin overlay to seal them up, and this will take care of the problem and prevent further cracks from appearing. If your asphalt surface has become lumpy and rippled, the original asphalt mix that was installed was off balance—too much asphalt, not enough crushed stone. It is also likely that moisture has gotten into the base, or the original paver laid down the wrong mix for the surface. Corrugated asphalt can appear 3-5 years after installation and, unfortunately, needs to be cut out entirely and replaced with patches of the correct full-depth asphalt mixture. You sometimes see these long cracks running along the edges of the road pavement. Edge cracks frequently happen when the underlying soil is poorly drained or otherwise unstable. Heavy vegetation can also causing damage, as can heavy traffic—particularly if the traffic load is too intense for the asphalt that was laid down or the base preparations that were made. We can fix edge cracks with asphalt crack sealing or emulsions, but it is also important to make sure that any vegetation is removed back from the road, and that any drainage problems are corrected as well. Alligator cracking or fatigue cracking in asphalt is a pothole waiting to happen, so it must be repaired before the problem gets more dangerous and expensive. Repairs generally involve removing the entire patch of damaged asphalt and re-doing the foundation to correct poor drainage problems and bolster the strength of the sub base before laying down a fresh section of asphalt. You’ll often notice these lower, depressed spots of pavement after a rain storm because that’s where puddles occur. Usually, these depressions indicate settling or degradation of the underlying layers beneath the pavement. There are a few options that can correct grade depressions in asphalt, including cold mill, overly and infrared patches. If the underlying problems can be addressed, this will also help prevent grade depressions in the future. When large sections of asphalt are laid down on roads or very large parking areas, it has to be put down in sections. Naturally, during a high quality asphalt construction job, the joints between the sections will be properly sealed together; if they are not, cracks can form along these joints. Even if the job was done properly, wide ranging temperature fluctuations, poor drainage and asphalt shrinkage can still cause cracks at these vulnerable joints. Prevention is the best cure for these and other asphalt cracks. Allow for proper drainage around the asphalt construction project and fill any cracks with an emulsion slurry or asphalt-sand mix. This name comes from the fact that these cracks, which are often straight and can form in a grid-like pattern, reflect cracking and shifting down in the lower levels of asphalt or the base itself. Moisture can get into these (and all the other) cracks and cause damage from expansion and contraction, so call Espina Paving and we will fill these cracks with a sealant/asphalt combination that prevents water or debris from getting in and making things worse. You’ve no doubt seen these somewhere before; the roadway has ruts where the wheels have consistently run over it. Rutting happens when the underlying ground was not properly compacted before the asphalt was laid down, or due to poor drainage and moisture getting in underneath. As traffic runs over the surface over and over again, it pushes the asphalt down and creates these kinds of ruts. Cold mill, overlays and surface patching can level and smooth out the asphalt surface. If the top layer of asphalt does not properly bond with the ground layer underneath, or if there was too much sand in the original asphalt mixture, big, wide gaps or wrinkles can develop in the pavement. The depth of the asphalt repair for slippage cracks depends on how deep the underlying problem is, but usually a partial or full depth replacement patch is necessary to stop the slipping. Regardless of what kind of asphalt cracking your roadway or parking lot has, it’s important to get these repaired as soon as possible. Smaller cracks are always less troublesome and less expensive to fix, and catching a problem early can save you and your residents, employees or customers a lot of hassle keep everyone safer. If you see cracks in your pavement, contact Espina Paving as soon as possible for assistance: (703) 491-9100.